Our intricately-designed and wide-covering South Indian Wedding Mandap owes as much to nature and natural beauty in its design as much as it does its construction. 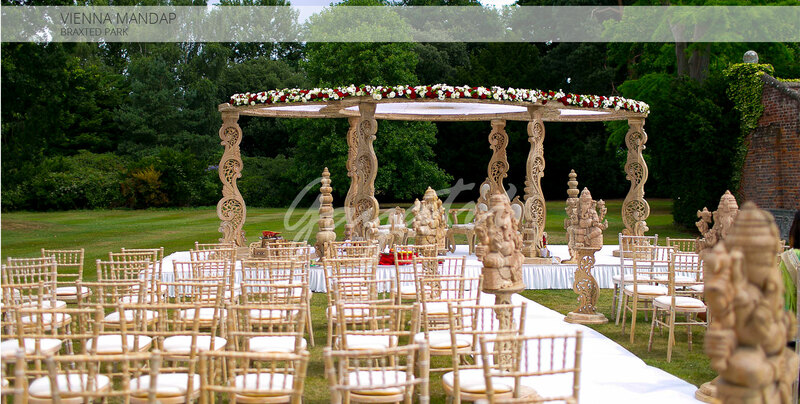 This splendorous extended circle, spirals high with intricate and traditional twists and curls cut into its many wooden pillars; shadowing over a polite but celebrated centrepiece and seating arrangement. Certainly; for a ceremony which demands architecture but with emphasis on those who are making the event special, the viana Mandap offers a keen, clean highlight to those marrying. The viana Mandap can be decorated uniquely in a number of floral arrangements and styles; with natural arrangements ideally adorning the upper circle of the structure itself. As with other Indian wedding mandap, ornamental decoration is also encouraged. The viana Mandap is a superb choice for a ceremony that puts its couple as the highlight of the day, but has architecture of enough splendour and tradition to showcase the happy occasion.